A staggering 3.1 BILLION has been spent on fixing or replacing broken gadgets in the last five years, a new UK study has revealed. Kat Robinson, Head of TSB Insurance, who commissioned the research, said: "Now more than ever we rely on our gadgets to get through the day, so it's unfortunate when they are taken out of action unexpectedly. The study also revealed our typical ‘walking wealth' - the cost of the gadgets we carry around with us on a daily basis - at an average of £288 per person. Three quarters of home owners cover themselves with home and contents insurance while just one in ten covers their gadgets as well as their home and contents. This is despite the average home containing over £2,500-worth of gadgets. 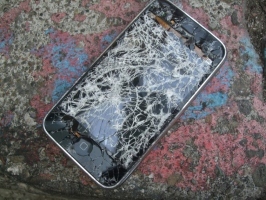 Almost a fifth of mobile users have experienced a smashed or broken screen. In the event of ‘the dreaded drop', one in ten immediately returned to the provider they were insured with to get the screen fixed, while 6 per cent powered through with a broken display. As for travelling, just 1 per cent of those polled thought that it was most important to have their gadgets insured abroad. And while only 5 per cent have lost or broken a gadget abroad, almost a third said that the item in question was uninsured. "Whether you want to protect the bricks and mortar of your home, the contents, or your latest piece of tech, it's important to pick insurance cover that protects you and adapts to your needs." Earlier this year, TSB launched a new, flexible home insurance, Pick and Protect, that lets homeowners pay for the cover they want, when they want it - helping cut out unnecessary or overlapping cover. TSB's Pick and Protect gives homeowners the flexibility to select what they do and don't want to cover. And if customers later change their mind, there's no admin fee for adapting their cover to suit their new needs.